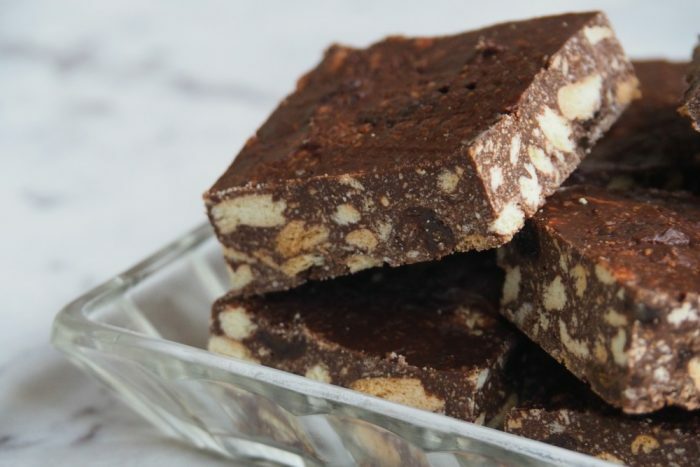 There are two words I love to see in a recipe, “four ingredient” and “no bake” and I love that I see both these wonderful word couplets can be applied to this recipe. I have no idea how the Hedgehog Slice got it’s name but I do know that it’s very delicious. 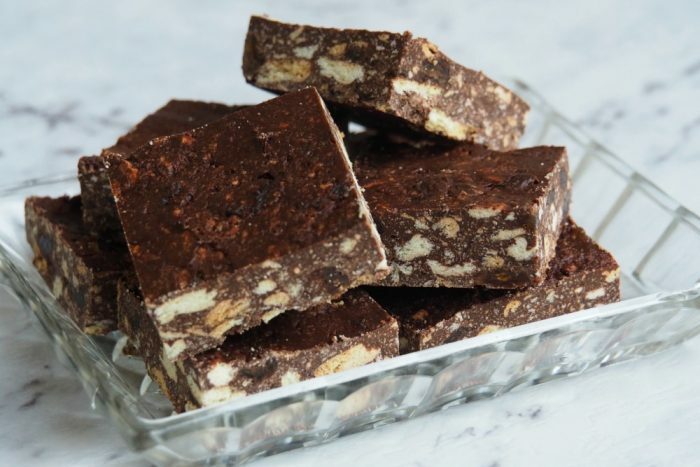 Think chocolate slice, packed with crunchy biscuit chunks and juicy, plump sultanas. 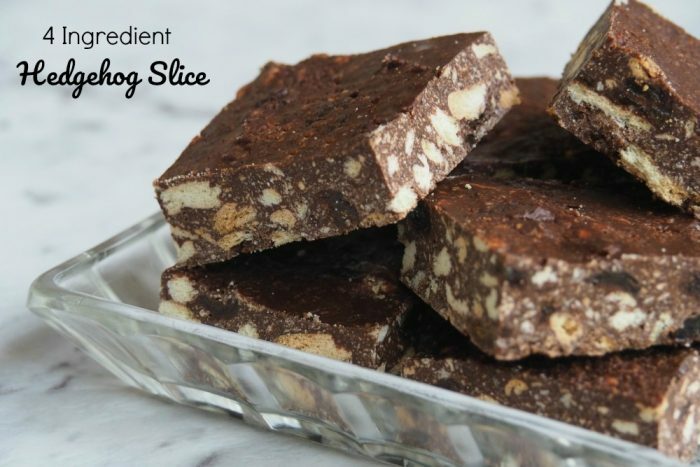 Of course, this slice is easily tweaked, just add in your favourite combo of cookies, dried fruit or even nuts, and off you go, on your one way ticket to Chocolate Heaven. This recipe is ridiculously easy, the hardest part is waiting for the slice to set! So tell me, if you had your pick of the pantry to make a Hedgehog Slice, what would you put in yours? Grease 8cm x 26cm bar cake pan; line base and sides with baking paper, extending paper 5cm over the long sides. Combine condensed milk and chocolate in small saucepan; stir over low heat until smooth. Place biscuit pieces in large bowl with sultanas; add chocolate mixture, stir to combine. Spread mixture into pan, cover; refrigerate about 4 hours or until firm. Remove from pan and cut into slices. Chop biscuits for 3 seconds on speed 4. Set aside. Combine chocolate and condensed milk in TM bowl for 3 minutes at 60 degrees on speed 3 or until chocolate has completely melted. Add biscuit pieces and sultanas and combine for 20 seconds on reverse speed 3 using the spatula to assist. Spread mixture into pan, cover and refrigerate about 4 hours or until firm. Remove from pan and cut into squares. 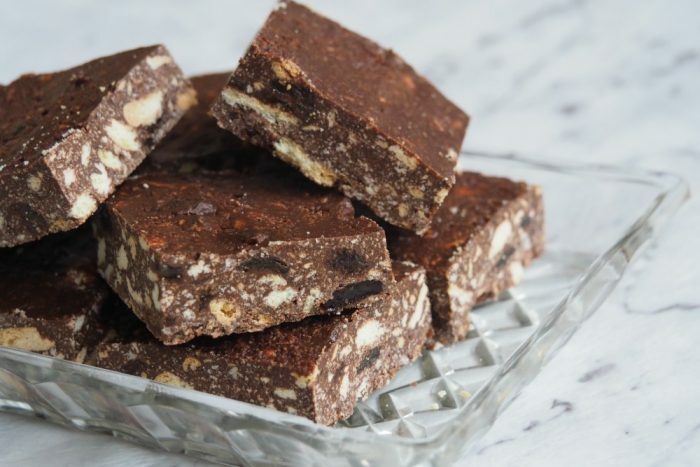 You can use a combination of dark and milk chocolate for a sweeter twist!